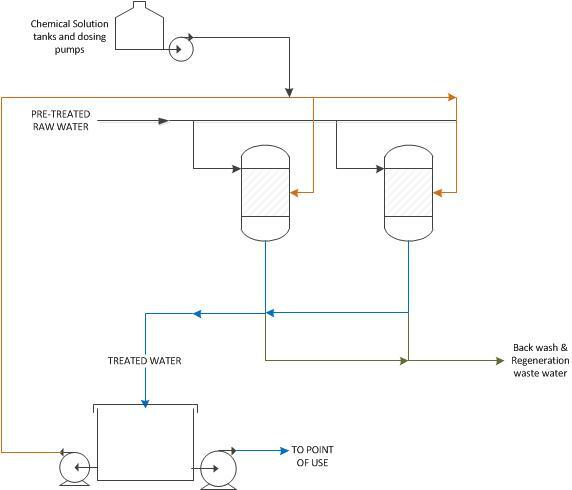 Two Bed Deionization is a physical process which uses specially-manufactured ion exchange resins which provides ion exchange site for the replacement of the mineral salts in water with water forming H+ and OH- ions. Because the majority of water impurities are dissolved salts, deionization produces a high purity water that is generally similar to distilled water, and this process is quick and without scale buildup. Ion exchange effectively removes more than 90 percent of barium, cadmium, chromium (III), silver, radium, nitrites, selenium, arsenic (V), chromium (VI), and nitrate. Ion exchange is usually the best choice for small systems that need to remove radionuclides. 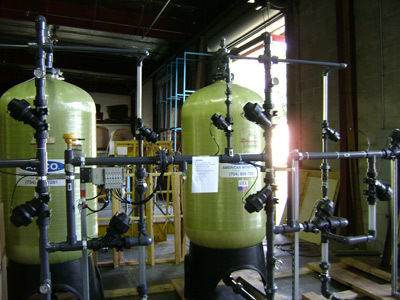 Ion exchange process, like reverse osmosis, can be used with fluctuating flow rates. Effluent contamination is virtually impossible. Large variety of specific resins are available from suppliers. Each resin is effective in removing specific contaminants. Ion exchange waste is highly concentrated and requires careful disposal. Potential for unacceptable levels (peaks) of contamination in effluent. Usually not feasible with high levels of TDS. Pretreatment required for most surface waters. Ion exchange units also are sensitive to the presence of competing ions. For example, influent with high levels of hardness will compete with other cat-ions (positive ions) for space on the exchange medium, and the exchange medium must be regenerated more frequently. Ion exchange is a process that exchanges one type of ion (charged particle) for another. Many troublesome impurities in supply water are ions, making this process extremely important in boiler water treatment. Ion exchange takes place in a closed vessel which is partially filled with an ion exchange resin. The resin is an insoluble, plastic-like material capable of exchanging one ion for another. There are two types: cation and anion resins. Each is capable of exchanging one or the other types of ions. In the demineralizer, water is treated in two steps. First, it is passed through the cation exchange bed, where the cations (calcium, magnesium and sodium) are exchanged for hydrogen ions. The treated water is now free of cations but is too acidic and cannot yet be used in the boiler. In the second step the water passes through the anion exchange bed where the anions (sulfate, chloride, carbonate and silica) are ex-changed for hydroxide ions. The hydrogen and hydroxide ions react to form water, now suitable for use in the boiler. A third ion exchange could be used to control alkalinity. Ion exchange resins have a limited capacity and will eventually become exhausted. They can be regenerated however; sodium cycle cation exchange beds are regenerated with salt brine, cation exchange beds are regenerated with hydrochloric or sulfuric acid and the anion exchange beds become regenerated with caustic soda. Salt brine regeneration is followed by a fresh water rinse to assure that no salt enters the boiler. Sodium chloride is often used to regenerate the exchange medium in ion exchangers because of the low cost of the chemical. However, this can result in a high sodium residual in the finished water, which may be unacceptable for individuals with salt restricted diets. This problem can be avoided by using other regenerant materials, such as potassium chloride.